The Suburban Extended Stay features kitchenettes with microwaves, refrigerators and coffee makers. The hotel has an outdoor pool, business services and complimentary parking. 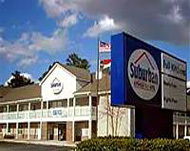 The hotel is six miles from Wrightsville beach and just four miles from the Jungle Rapids Family Fun park. There are 107 rooms that include single, queen and guest double rooms. There is free high speed internet access and complimentary morning coffee in the lobby.